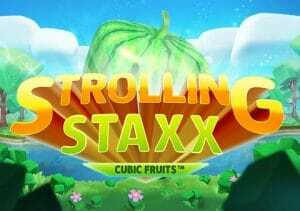 Get your 5 a day and more in Strolling Staxx: Cubic Fruits, a 5 reel, 10 payline video slot from NetEnt. The highlight of this simple game are the re-spins where stacked symbols shift across the reels. Play with Bonus Bet mode active and look out for colossal symbols that can create even bigger winning clusters and extra re-spins. Play on your PC, tablet or mobile from between 10p and £200 per spin. This fresh take on the classic fruit machine is a colourful one. You’ll see a 3D style riverbank and stream in the background. On the reels are A to J royals plus 5 potentially much more tasty fruit symbols. You’ll see plums, cherries, lemons and strawberries. The tastiest of the quintet is the melon. Land 3, 4 or 5 of these on a payline and you’ll pocket an award of 2.5, 10 or 50 times your bet. There’s also a wild that replaces all other symbols. It too offers awards of up to 50 times your bet per payline. All symbols, standard and wild, can land as singles or in 2×2 or 3×3 colossal blocks. The best chances of landing a big payday come via the Strolling Staxx Re-Spins feature – to trigger it, you’ll need to fill the whole of a reel with the same symbol. A re-spin then follows with the stack of matching symbols, plus any matching symbols attached to them moving 1 reel to the left. A payout calculation follows. The re-spins keep on coming until there are no triggering symbols left. Increase your stakes from 10 to 15 coins per spin and you can bring the Bonus Bet and Extra Chance feature into play. The Extra Chance becomes live when you trigger the Strolling Staxx Re-Spins feature from single rather than colossal symbols. Once the re-spins begin, colossal symbols drop down onto the reels. These can hit in partial or full blocks to create even bigger winning clusters and potentially extra re-spins. If you have the bankroll, we suggest playing with the Extra Chance feature activated. The extra colossal symbols that can hit during the re-spins can really get things moving. Strolling Staxx: Cubic Fruits is a simple and rather repetitive game. It’s certainly not a boring one though. We found plenty of action here, especially when we triggered the re-spins. If you’re looking for a fruit machine with a funky feature, then you should do just fine with Strolling Staxx: Cubic Fruits. If you want free spins and backstory, NetEnt’s Planet of the Apes and Vikings are worth looking at.